While I was a drama student in England and attending a Mime school in Paris, I scribbled. I continued this habit between acting jobs and on Sundays, when working six days and six nights a week in repertory theatre companies. I wrote poetry, lyrics, comedy sketches and diaries followed by a novella and a collection of ten short stories using a song from Joseph and his Amazing Technicolour Dreamcoat as a catalyst. The song had eight pairs of colours and a single one making nine stories. My tenth story encompassed all the colours. One of these stories stayed with me so powerfully that I had to find out what happened next. And so I began my first novel. I carried out research, wrote on trains, in tube stations, theatre dressing rooms, a caravan I lived in while working at a theatre in Devon and on a fire escape in London in the early hours of summer mornings. The first draft took three years to write interrupted by acting work, the second draft another year. It was while performing at Birmingham Repertory Theatre that I received a telegram from my literary agent telling me it had been accepted for publication. The colours were green and brown. They made me think of youth, vulnerability and earthiness. One afternoon, while day dreaming around these colours I saw an image in my head of a small, frightened evacuee standing in a graveyard. He reminded me of the two little boys my mother had told me about when she had been a nurse in a London hospital during the blitz. One had crawled under the bed never having slept in one before; the other had been sewn into his underwear for the winter. That gave me his background. As I was jotting these ideas down, my mother suddenly died. Her funeral took place on a beautiful day in May. When we arrived at the graveyard I noticed a small house through the trees. I discovered it was where the man who looked after the graveyard lived. I decided that my little boy would be billeted there only I set the graveyard in a country village. It was as though my mother had not only given me William but also Mister Tom. Goodnight Mr Tom is about two people, William and Mister Tom, who have both been hurt by life. Through the circumstances of war they find themselves thrown into each other’s company. It is through living together that they heal one another. Most of my novels contain people from my previous books or the seed of an idea for a future one. The seed for Back Home evolved from a photograph I came across while carrying out research for Goodnight Mr Tom. It was of a group of boys and girls on the deck of a ship arriving in England from America in 1945. They were sea evacuees. Their clothes and their hairstyles looked American. Even the manner in which they stood seemed American. Most of them had been sent away from England in 1940 when the Germans invaded France. When some of the ships carrying them were sunk it became too dangerous to continue evacuating them. Churchill also believed it was bad for morale to see people fleeing the country. Their parents had no idea that they would not see them again for five years. As a seven-year-old child I had travelled to Australia with my parents and little brother. My father, who was in the Navy, had been stationed there. Returning home two and a half years later I had little memory of England. My culture was Australian. England was a cold foreign country to me. My mother sent me to Elocution lessons to get rid of my accent. For years I had believed it was for snobbish reasons. It was only much later that I understood why. I suspect that she believed that until I had lost it I would not make friends. Knowing the difficulties I had experienced after only two and a half years away from England accompanied by my parents I wondered how these children coped after five years away from home without their parents. I surrendered and began my research. I met sea-evacuees, listened to them on the telephone and read their letters. This led me to explore American children’s books, American Art, popular American music, traditional American stencilling, and through two chance encounters in a library in Connecticut and in a canteen in the British Library in London I was able to find out what it was like to be in Junior High in the 1940’s. 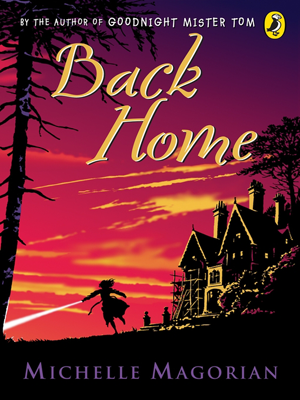 Back Home tells the story of twelve-year-old Rusty. Like many shocked, disorientated and lonely sea-evacuees she is faced with bombed streets and rationing, has to adjust to living with relatives who seem like strangers including her four year old brother born in her absence and is expected to behave like an English girl. Both of these books have been adapted for the screen and radio and it has given me enormous pleasure to know that adult and child actors have played roles I have created. 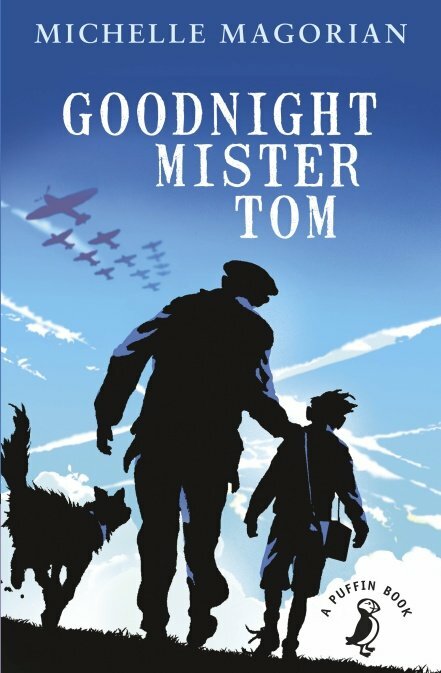 There has been a musical version of Goodnight Mr Tom with the composer Gary Carpenter, (I wrote the book and lyrics), radio dramatisations in Sweden and Norway, an abridged reading on BBC radio, a television drama with the late John Thaw playing Mister Tom and more recently, a stage play adaptation written by David Wood. Strange to think that it all began with the two colours, green and brown.